Ignore my sensitivities as they are not all dialed in. I'm also using mouse tilt left as my ping if you see the [. The official ST is not release yet. We are going to use Titan Fall 2 for this example. You can do this with any other Config ST.
We are going to use the default mapping as an example. Use your own keys to map actions following the next instructions. Uses Analog stick to select options on the dial menu. 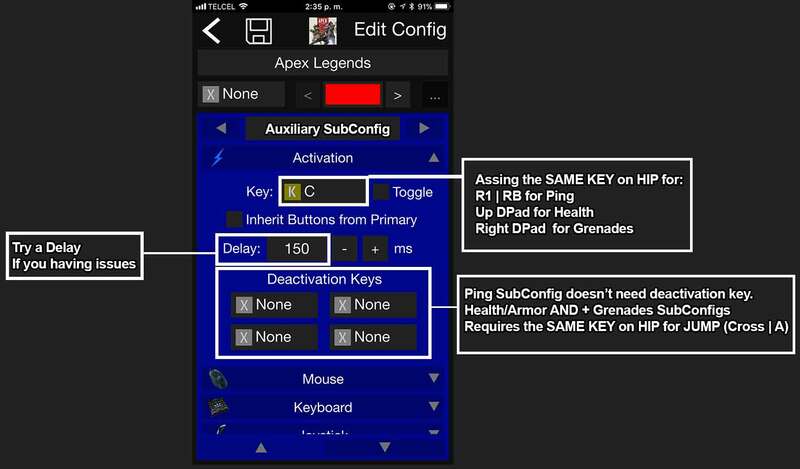 TIP: Make sure the sub-config activation button allows you to keep your thumb on the stick. Select options on the dial menu by moving the mouse when the Turn Assist button is held down. You can use a key or mouse button. Every single movement you made while holding down the Turn Assist button, is equally to a full joystick movement on that direction. 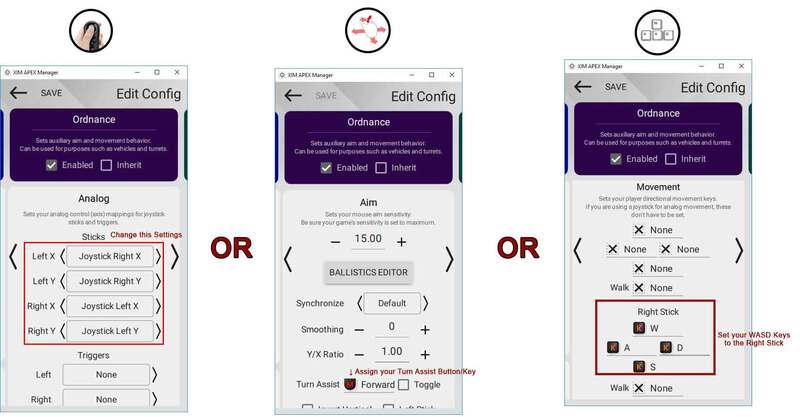 Makes easier to select with the mouse. TIP: Make sure the sub-config activation button allows you hold both: Turn Assist button and the Activation Sub-config key. 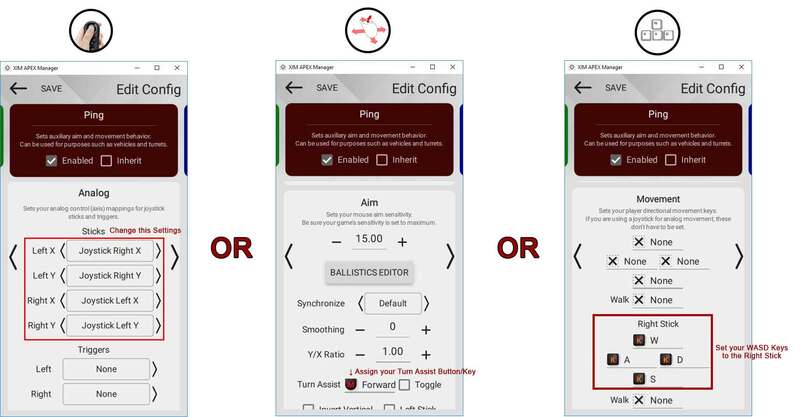 Select options on the dial menu by using WASD keys. TIP: Make sure the sub-config activation button allows you to press WASD keys freely. Mouse buttons are recommended. 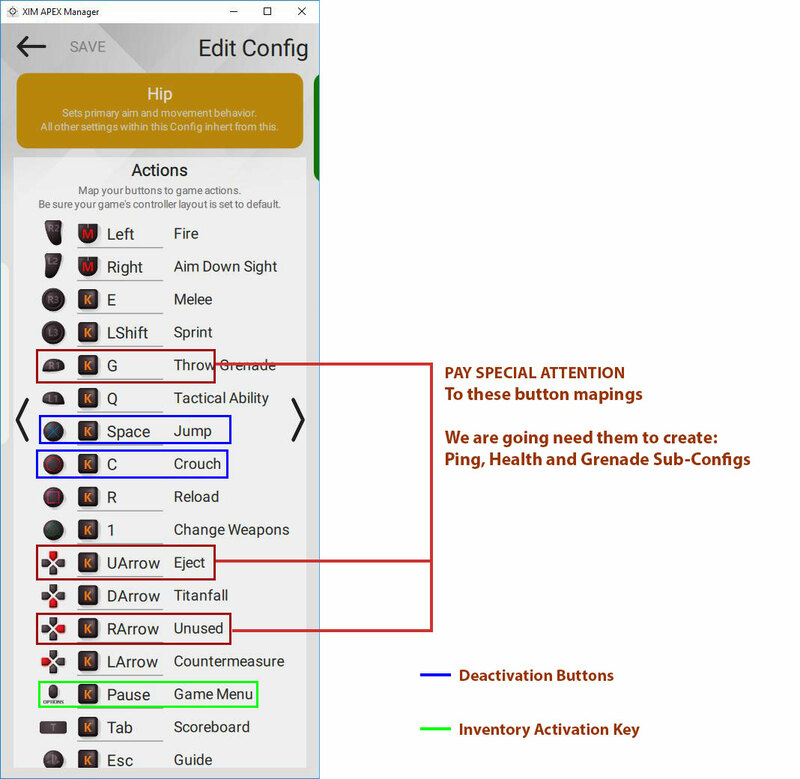 Hold key G, to enter to the PING Sub-Config, in-game you will see the Ping Dial. 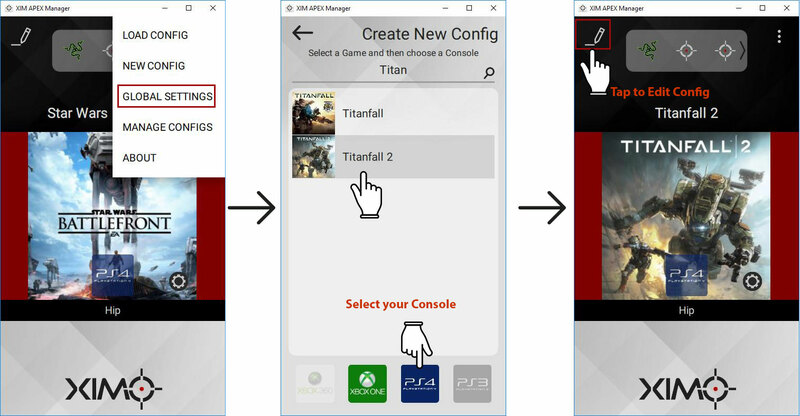 Swipe to the Right for a New Sub-Config Page. Check the box to Enabled. Rename as: Inventory. NOTICE: This subconfig works TOGGLE Behavior, this means you don't need to hold the activation key. 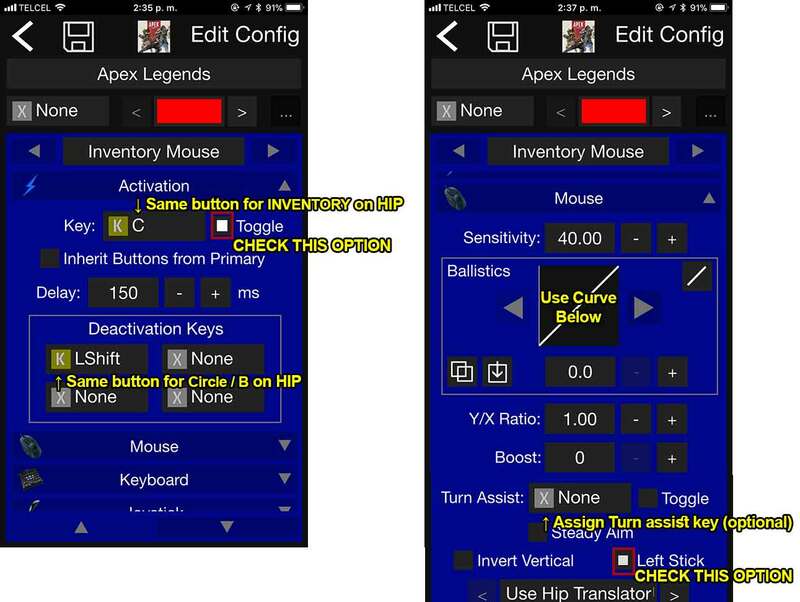 In this case when you press the Inventory button XIM manager enters to Inventory Subconfig Automatically. 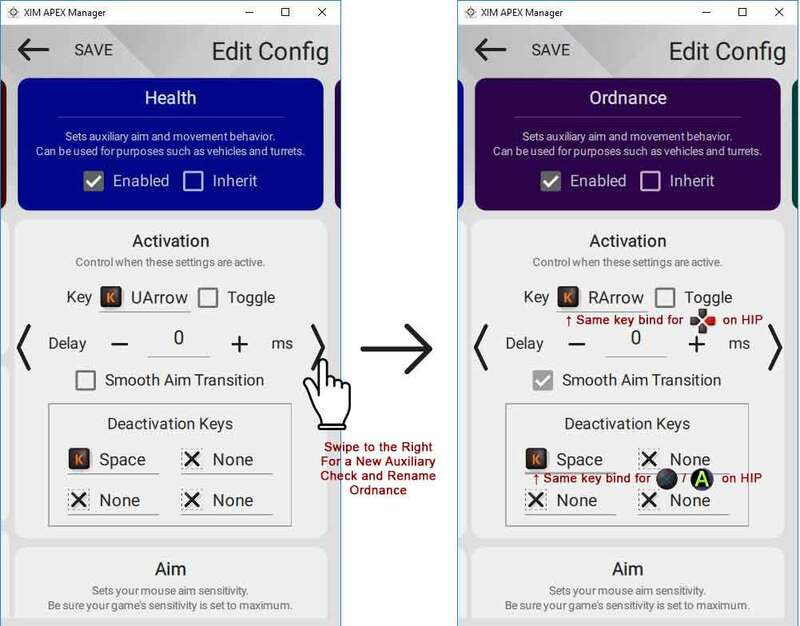 Is highly recommended to have a SECONDARY KEY BIND for Options/Menu to access game settings. Ok so I use the Nav and g502....I have it all settup good enough right now so that when I loot a bag I can use my mouse cursor and all that BUT i have to scroll down the loot bag if they have a lot of loot with the analog on the nav....can I get it to where I can use the mouse wheel to scroll down so I dont even have to use the nav when looting a box? Now you can scroll down or up with the mouse wheel. I agree Nav is better for inventory navigation. Mouse requires tweaking, try different curves and sensitivity to feel better. Try adding a 200 ms activation delay to the Ping sub-config. 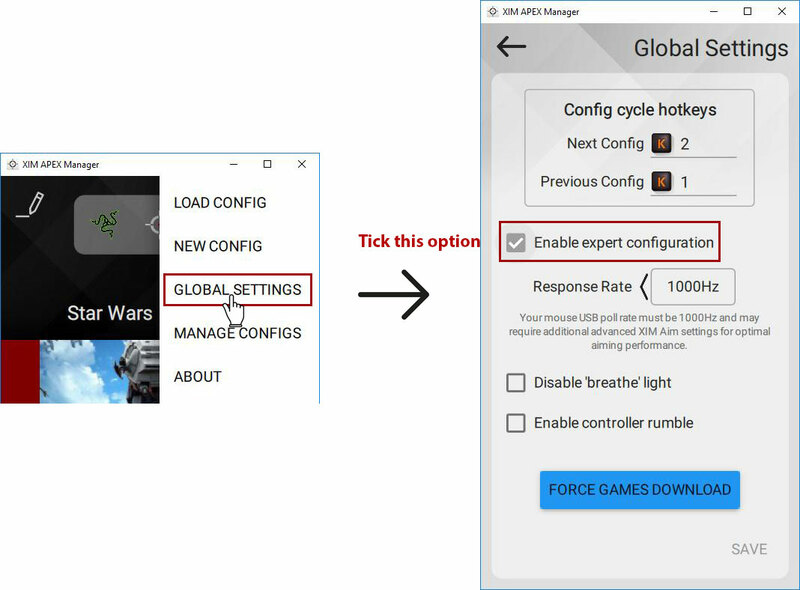 For XIM4, I think analyzing the principles on this guide you can figure how to do it on XIM4, is actually more straight forward because you don't have to enable expert config, and all the options are already available. 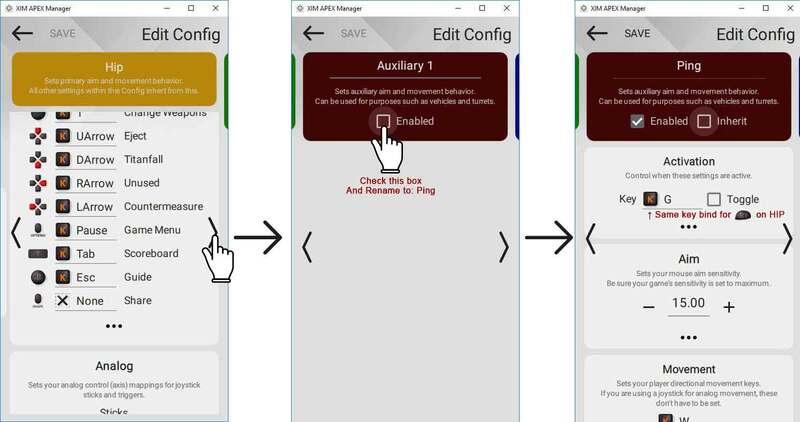 Yes, can be done on XIM4. I don't have my XIM4 at this moment, borrowed. Thanks, I'll try this tonight. everything works as it should for me but the health menu im having issues with. im not able to make it to pop up for me and i cant even use quick heal with keyboard to do just like pressing up on ps4 dpad, sometimes it register the button press if do real quick double taps but most of times it dont. i tried different keybinds with no luck. 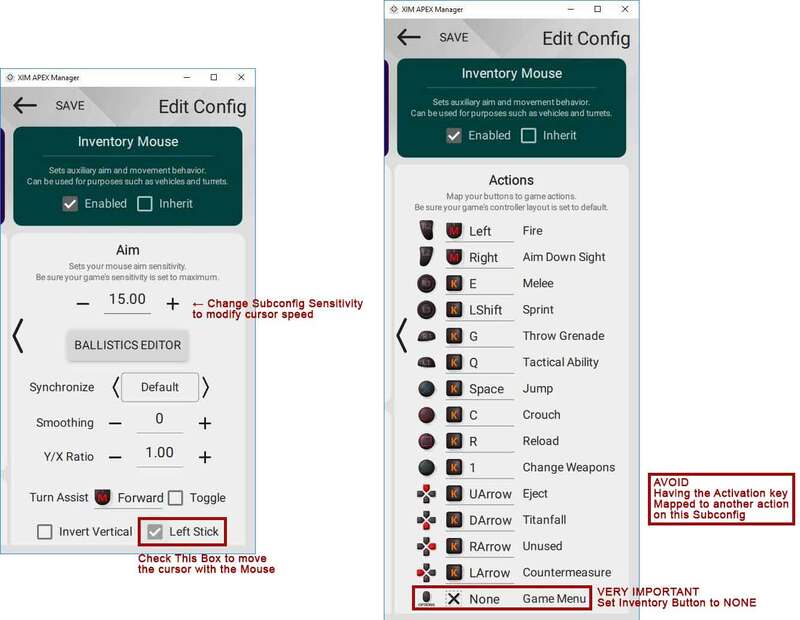 When I setup the inventory button, I can’t move my mouse, I need to use the keyboard 9 time on 10. Sometimes it’s is working...and I setup everything like screenshot. Anyone have the same issue ? Hi everyone, great guide thanks, I can set everything up but I've come across a few teething/performance problems, I was hoping one of you fine chaps could help me out to see if I'm doing anything wrong. 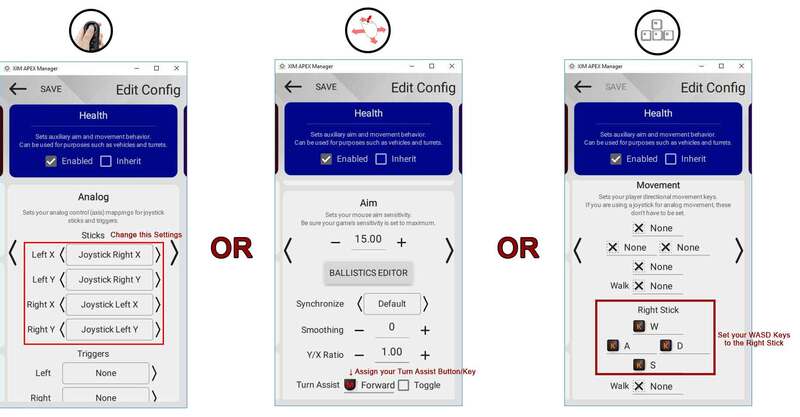 I have set this up however, when you use a consumable like syringe it takes you out of the menu but the sub config remains on as you can't set mouse 1 to deactivation as you might need to use mouse 1 multiple times whilst in the menu. Any work arounds? 2) I can't set this up properly for looting, it goes haywire trying to active it,is it because you have to hold X down? FYI I have it set as a secondary reload Anyone else have this problem? I love this work around, but it means you can walk forward without cancelling using a consumables, shield cell etc. Anything I can do? 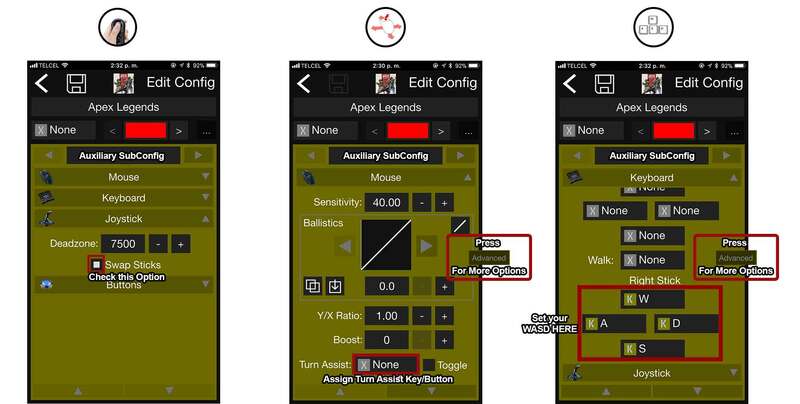 does this guide still apply with the new apex legends ST? Would this also work for fortnite inventory when moving items to different slots ?